Warm and satisfying one-pot meals make dinnertime an easy task, and with only one skillet, pot, or baking dish, there's very little cleanup. Many one-pot meals practically cook themselves! There are some wonderful soups, stews, and roasts that do well with very little preparation time. And many adjust easily to the ingredients you have on hand. One of the most commonly used pots in this type of cookery is the Dutch oven, a large, heavy kettle or pot with a tight-fitting lid. The Dutch oven is sometimes called a casserole since it can usually be used in the oven or on top of the stove. The origin of the name is unknown, but there is evidence of the use of large iron stewing pots in Colonial America. The name is thought to have come from the Pennsylvania Dutch. For some dishes, you might want to add store-bought or homemade biscuits or crusty bread. A simple tossed green salad goes nicely with a casserole, or you might just add sliced fresh tomatoes and cucumbers. Whether you are looking for a recipe for the slow cooker, a casserole dish, skillet, or stockpot, you are sure to find the perfect meal here. 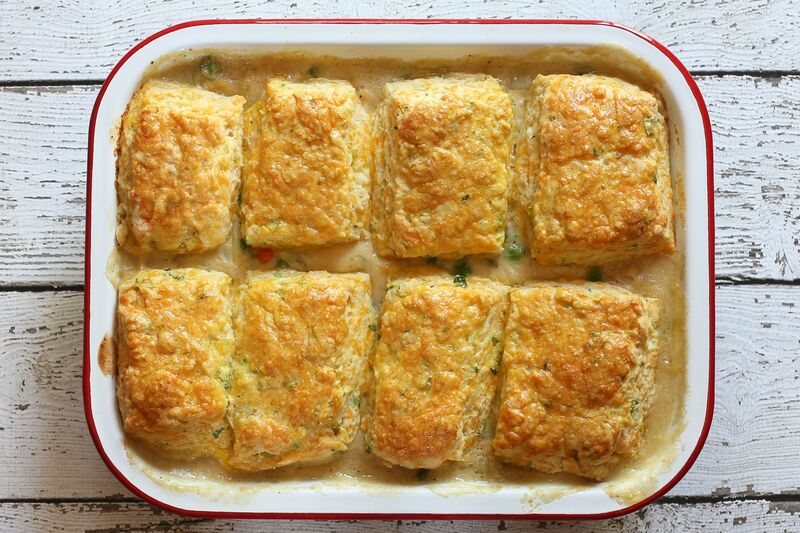 This baked chicken pot pie is topped with homemade cheese biscuits. Add a salad or sliced fresh tomatoes for a fabulous family meal. If you enjoy Tex-Mex flavors, you will love this spicy King Ranch chicken casserole. Diced cooked chicken is layered with tortilla strips and a delicious, creamy sauce. This jambalaya is a fabulous one-pot meal with amazing flavor. Use spicy andouille sausage or a milder smoked sausage in this great-tasting dish. The sausage teams up with lean diced pork or ground pork, rice, and black-eyed peas. This one-pot pasta and ground beef dish will quickly become a staple in your household. Use Mexican or Cajun spices and tomatoes in the dish, or use your favorite flavor profile. This breakfast casserole is all you need for a hearty and satisfying breakfast or brunch. 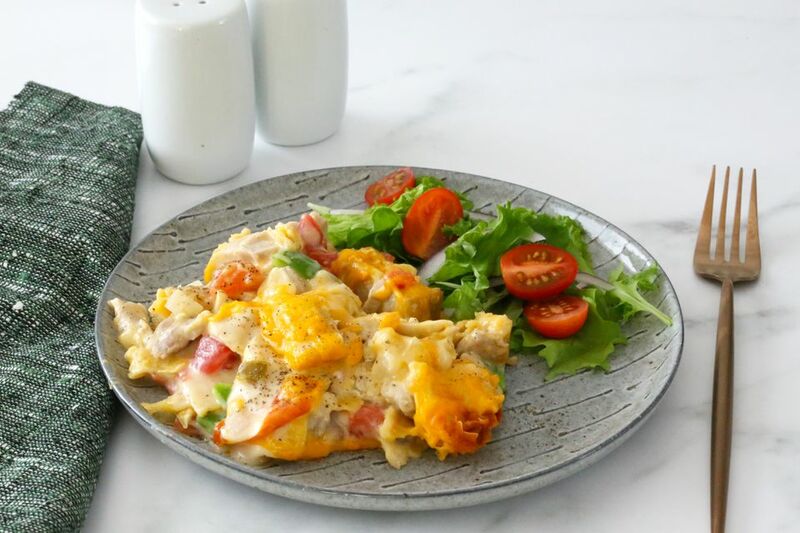 This cauliflower, cheese, and sausage casserole is a complete low carb meal. Add a tossed salad or sliced fresh tomatoes. Use a halved or quartered chicken or use whole chicken legs in this all-in-one chicken and vegetable dinner. This delicious stew gets amazing flavor from bacon, Guinness Stout, and a variety of seasonings. The beef stew is simmered to perfection on the stovetop. A pot roast is always a good choice if you're looking for something to cook in one pot. This one is a stovetop version with potatoes, carrots, and some herbs. Some red wine is included, but if you don't cook with alcohol, that can be replaced with more beef broth or some apple cider. This easy, cheesy casserole is topped with pork chops, cheese, and French fried onion rings. Garlic and butter flavor this fabulous shrimp and rice bake. Pecans add crunch, but may be omitted. This budget-friendly beans and hot dog casserole is topped with biscuits and shredded cheese. This mixture of beef and beans is well-seasoned and makes a great everyday family dinner. With a biscuit topping, it's a complete meal in one dish. If you like burritos you'll love this all-in-one burrito casserole. Beef, refried beans, and spicy sausage are among the ingredients. The high-flavor beef filling is layered with flour tortillas and baked to perfection. We served this meal with steamed mixed vegetables on the side, but it could just as easily be served in a bowl with crusty bread or biscuits. Add a side salad or fresh sliced vegetables if you like. This casserole is our take on the comforting Lancashire hot pot. My version is made with andouille sausage and thinly sliced potatoes. Serve this scrumptious pizza casserole with toasted garlic bread and a simple green salad. Use lean chuck, bottom round, or a rump roast in this easy slow cooker pot roast. Potatoes and carrots round out the meal. Feel free to add rutabagas or parsnips. Potatoes, carrots, and green beans make these tender, flavorful beef short ribs a complete meal. The ribs are slowly braised in the oven. Chicken is slow cooked to perfection with stuffing, and it's super easy to make. Simple steamed broccoli, corn, or peas make it a well-rounded dinner. Make this easy slow cooker chicken dish with frozen or refrigerated biscuits, or use the included recipe for homemade biscuits. This slow cooker turkey and rice casserole is a nice way to use leftover turkey, and it's easy to prepare and cook. Leftover turkey is combined with rice, condensed soup, and water or broth and slow cook to perfection. The vegetables are added about 20 to 30 minutes before the dish is done. This easy dish will quickly become a family favorite. Taco seasoning adds great flavor to this cheeseburger macaroni dish, and it's quick and easy to prepare in the skillet. Spicy Southwestern flavors are featured in this chicken lasagna. You'll want to add hot crusty rolls, cornbread, or biscuits to this tasty one-pot beef and bean dish. Apple juice and vinegar add flavor to this sausage, potato, and cabbage dinner. The pressure cooker is a great way to cook beef short ribs to tender, succulent perfection. Potatoes make it a one-pot meal. Pork sausage, tomatoes, chopped bell peppers, and spicy seasonings make this a hearty and tasty macaroni and cheese. The casserole is baked with a buttered bread crumb topping. This dish is like a hearty chili beef stew with easy biscuits. The Tex-Mex seasonings and a sour cream and cheese topping make this casserole stand out. This Tex-Mex casserole features layers of chile seasoned beef, ripe olives, Mexican cheese, and flour tortillas. If you have ​some leftover pork roast, this casserole is an excellent choice. The pork and pasta casserole makes an easy, tasty, and satisfying everyday family meal. These Louisiana-style mussels are flavored with a spicy sauce. The sauce is made with tomatoes, garlic, and the "holy trinity" of Cajun cooking. This classic Brunswick stew is made with a combination of chicken thighs, pulled pork, beans, and tomatoes are among the ingredients. Add cornbread to make a satisfying meal. Try it and see why it's a southern favorite! This remarkable Southern dish combines chicken and optional shrimp with exotic curry flavors. It isn't clear how the dish made its way to Georgia and South Carolina — and even farther up the East coast — but it is fabulous stew. This delicious dish is like a stovetop pot pie, made with a whole cut up chicken, mushrooms, chicken broth, and seasonings. The easy cornmeal and flour drop dumplings can be made from scratch or with biscuit mix. This is always a hit, and it's super easy to prepare. Cook this tater tot casserole in the slow cooker or in the oven. This crowd-pleasing meaty ziti casserole is similar to a lasagna, but it's much less time-consuming. The ziti is cooked and tossed with the ricotta and meat sauces, then it's layered with more sauce and cheese. Use quartered artichoke hearts in this cheesy chicken and pasta bake, or use another vegetable. Diced ham and Swiss cheese make this family-pleasing pasta casserole flavorful, and the buttery bread crumb topping is the perfect finishing touch. This casserole is a combination of ham, cooked spaghetti, and the tasty pea pesto. The green pea pesto is made with walnuts, Parmesan cheese, and basil. This sausage and bean stew is loaded with flavor. Butternut squash and apples are complementary flavors. This slow cooker shepherd's pie is made with layers of ground beef, potatoes, and green beans. This version with ground beef is better known as a "cottage pie." For a traditional shepherd's pie, use ground lamb. All you need is rice to make this a complete meal. The word etouffee is a French word meaning "smothered," or "suffocated." As you can see in the photo, the shrimp is smothered with a combination of chopped vegetables and tomatoes in a rich brown roux. Your family will love this rich, flavorful chicken and sausage gumbo. Scale the recipe up for a party or game day gathering. This quiche is an excellent dish to prepare for brunch, lunch, or dinner, and it is a tasty way to use leftover turkey. This easy chicken casserole is easy and versatile. Chicken a la king flavors stand out in this dish. This skillet has is a snap to make with cooked potatoes, ham, and seasonings. Use red or green bell peppers or a combination. This cheesy ham and pasta casserole is baked with a buttered bread crumb topping. It's an excellent way to use leftover ham. This easy slow cooker hash brown dinner takes just minutes to assemble, and it's an excellent choice for a busy day. Just set the slow cooker and you're free for the rest of the day. This casserole is a mixture of lean ground beef, corn, thinly sliced potatoes, and cheese. Add jalapeno pepper or use mild chile peppers. A thick, budget-friendly chuck steak and vegetables make a tender, delicious family meal using this easy oven method. This recipe has long been a popular way to cook the tougher but flavorful chuck. This is an easy sausage and vegetable roast with carrots, potatoes, and smoked sausage. Simple seasonings flavor this dish. No browning, no fussing, just put the roast in the crockpot in the morning, add a few cans of soup and vegetables, and you have a delicious meal in 8 to 10 hours. Use leftover or deli corned beef in this flavorful casserole, and top it off with French fried onion rings or breadcrumbs. If you use canned corned beef, refrigerate the can for a few hours so it will be firm enough to cut into cubes.